The study of entity’s risk assessment process comprises the risk assessment relating to reliability of financial statements. (a) What risks have been identified by the management? (e) What risks have not been identified? For example, if the management has not identified the risk that suppliers may be paid for goods not supplied, the auditor should extend substantive procedures in this area. (i) New personnel may not understand operations of internal control (if there is change in staff). (ii) Repaid growth may result in breakdown of controls. (iii) New accounting pronouncement may not be applied effectively in initial stages. (iv) New technology may affect operations of controls. (e) Non-standard journal entries for example, consolidation adjustments, sale of scrap, assets disposal, allowance for obsolescence and bad debts. (f) Accountability of assets, liabilities and records. (g) Resolve incorrect processing of transactions. – Restricting physical access to assets and records. No one person should be involved in all the stages of a transaction. Management is not only responsible for designing and implementing a system of control. It has also a responsibility for maintaining internal control system and monitor on an ongoing basis. Monitoring involves obtaining reasonable assurance that the controls are operating as intended. Internal audit function is important for regular monitoring of controls. Discuss the concept of risk assessment at financial statement leveI. (e) Inability to obtain sufficient and appropriate audit evidences where the accounts are not auditable. 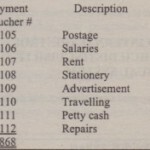 (iv) Cut off – transactions have been recorded correctly as to period. (v) Classification – transactions have been recorded correctly as to account. (ii) Right and obligations – the entity holds or controls right to assets, and liabilities are the obligations of entity. (iii) Completeness – there are no unrecorded assets, liabilities arid equity. (i) Occurrence and rights and obligations – disclosed transactions and events have occurred pertain to entity. (ii) Completeness – all required disclosures have been made. (iii) Classification and understandability – Financial and other information is appropriately presented and clearly expressed. (iv) Accuracy and valuation – financial and other information are disclosed fairly at appropriate amounts. What could be possible risks for completeness assertion of cash sales. (b) The data is lost or transferred inaccurately to computer system. (c) Cash sales are not recorded in cash book and cash is stolen. (d) Cash sales invoices prepared but cash is not received. Multiple number of units sold with unit sales price. Compare cash sales of current year with last year (after adjustment for price increase). Compare cash sales with budgeted cash sales. Explain how the auditor should update his understanding obtained last year relating to internal control system. 1. Review last year’s working paper me. 2. Ascertain the system from client’s system manual. 3. Inquire from client’s staff any changes since previous year. 4. Record changes since previous year. 5. Perform walk-through test selecting a few transactions relating to each class of transactions, till final reporting in financial statements. The ‘objective is to confirm the understanding obtained from inquiry and study of system’s manual. Why the auditor should obtain understanding of the entity’s business and its environment? Understanding of the entity’s business and its environment assists the auditor in assessing inherent risk at assertion level and at the level of financial statements as whole. The assessment of inherent risk along with control risk is useful to determine timing, nature and extent of substantive procedures. Design a suitable system of internal controls for fixed assets in case of medium size manufacturing company. 1. A long term budget for fixed assets should be prepared in accordance with corporate objectives. 2. The budget should be reviewed for feasibility. 3. Assumptions for computation of internal rate of return, payback period and return on investments should be reviewed. 4. The budget should be approved by Board of Directors. 5. Goods received notes should be raised for acquisition of fixed assets. 6. The non current assets register should be updated. 7. Supplier’s invoice should be approved. 8. Arithmetical accuracy of suppliers’ invoice should be checked. 9. The budget should be updated. 10. The equipment should be tested for proper operation. 11. Physical assets should be regularly compared with records. 12. . Disposals of fixed assets should be checked for authorization. Why the auditor should obtain understanding of the entity and its environment? b) Adequate planning is not possible without obtaining understanding of the business. (e) Approaching the audit from view point of businessmen will be appreciated by the client if the auditor is concerned about the client’s problems. Such approach needs in depth knowledge of the client’s business and the industry in which client is engaged. For example, useful information about latest developments in industry may be provided to client. Also the knowledge of the business is used to assist the client in achieving its objectives of efficient and effective operations. (f) Knowledge about related parties. (g) Risk assessment if the company trades through e-commerce. (h) Unusual fluctuations in trend and ratios may be indicative of material misstatement. (i) Knowledge of business will enhance understanding of the transactions and their business rationale. The auditor need not study all internal controls of an entity. Give examples of internal controls relevant to auditor. Internal control objectives include reliability of financial statement effective and efficient operations and controls over compliance with laws and regulations. The external auditor is concerned only with those controls that aff reliability of financial statements. Moreover, only key controls need studied. One of the characteristics of control environment is management philosophy and operating style. Explain your understanding of “management philosophy and operating style”. – Management’s approach to business risks. How the monitoring of internal controls is performed by the client? Explain with example, difference between internal control questionnaire (ICQ) and internal controls evaluation questionnaire (ICEQ). Innternal control questionnaire is simply a list of question in order to ascertain what controls exist. Internal control evaluatior questionnaire assists in evaluating whether the systern can prevent, correct and detect material misstatements. Are purchase order issued for all purchases? Can unauthorized purchases be made? Discuss internal controls with reference to small entities. 3. Some controls are not established because of cost vs benefit relationship.